UDM Downloads > Merge PDF Files! Merge PDF Files Software is a versatile and user-friendly PDF tool .It arrange pages very graceful and effective manner. PDF joiner application can merge or split PDF files in any order to produce much lighter and better in memory. It manages files according to requirement. PDF file splitter program split PDF documents into pages & you split Acrobat files and generate smaller PDF files based on EVEN / ODD pages or specific pages. You split one or more PDF files based on page groups & page ranges. PDF split and merge program make path to know about deleting, adding, combining, joining, arranging, extracting from PDF files. PDF splitter merger is used to solve the problem related queries, so that it will simply transfer through mail. It can easily save a selection of pages into a different file and merge pages of invoices, bank statements, contracts or e-Books in one file. 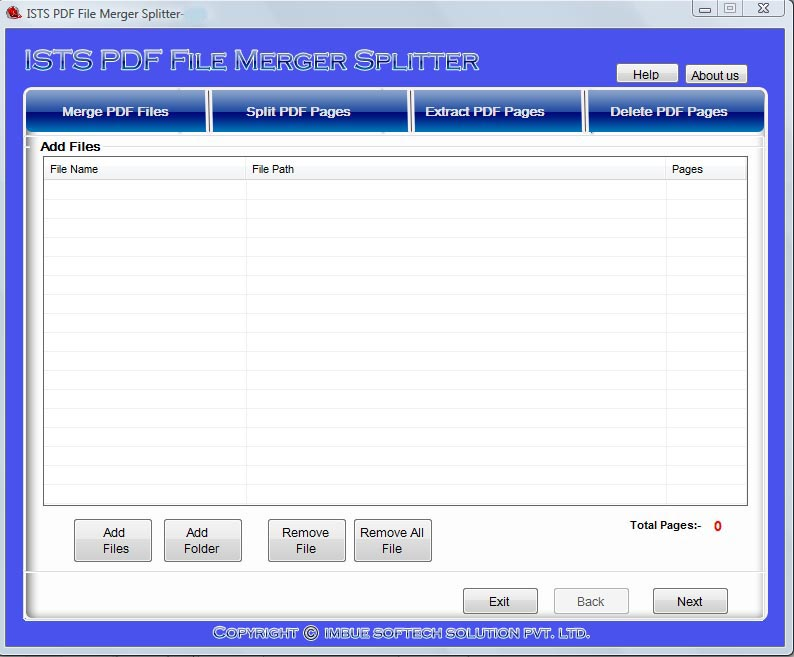 PDF Merger splitter Software can delete PDF pages, Merge PDF pages, extract PDF file, Split PDF documents according to need. Combining PDF pages can also join break split delete remove combine PDF files. Merge PDF Files Features: * PDF Split Merge is a stand-alone tool for splitting, merging PDF documents. * PDF files joining tool combine multiple PDF document. * PDF software is use to manage, organize and arrange pages very careful and effective manner. * PDF combiner has ability to merge the PDF files into odd or even pages * PDF tool supports different operating system like windows 7, Vista, XP, 2000, 2003, ME, NT. * Combining PDF pages can break a document into single pages or sets of pages. * Merging PDF Software having more user friendly graphical interface. * Merge PDF pages of invoices, bank statements, contracts or e-Books in one file. * Merge PDF files can break a document into single pages or sets of pages. * Combine PDF is very cost efficient, time saver, fast and easy tool for splitting and merging PDF files.